There should be a picture of my boys in the cute plaid shorts outfits that Babu sent. (Not matchy-matchy to each other in case you are worried) This is sad because if there was an American Eagle for kids (is there??) my two handsome lads would have looked like they just stepped (or crawled) out of their catalog today. They were that stinkin' cute. But I didn't have a chance to grab my camera other than the one on my phone. Why is that? Today I took SirCrankyPants (the artist formerly known as Bubby) to the doctor. He has a double ear infection. 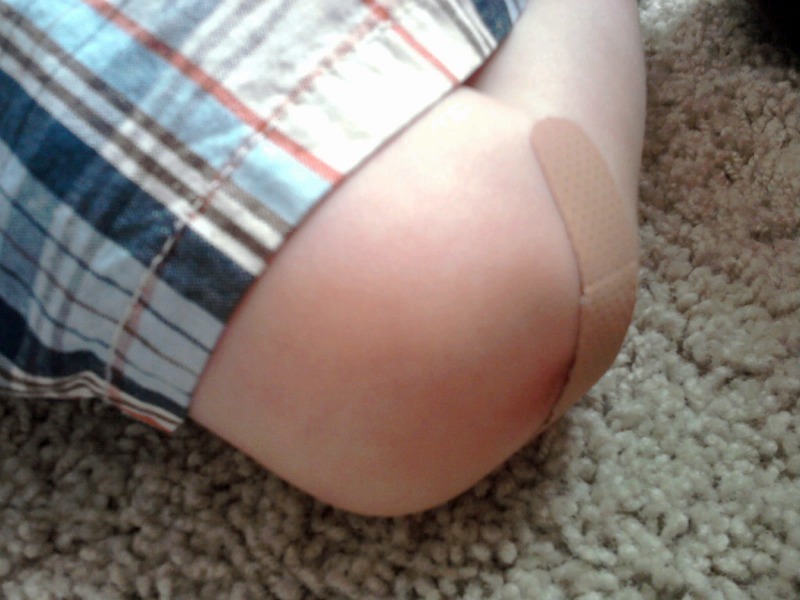 He tripped on the way out of the doctor's office and scraped up the knee he tore up at church on Sunday. 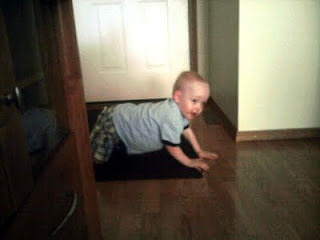 He climbed up on the kitchen table three different times today - each time clapping and grinning - so proud of himself. While I was cooking dinner, he put his hand on/in the skillet faster than humanly possible. I was RIGHT there. And although I got his hand out very quickly, there is still a slight burn mark on his palm. He would not let me take a picture of it. He landed himself on the naughty rug twice today. Today he was not feeling very spiritual, unlike yesterday when he gave a hearty, "Amen!" at the end of his time there. I am sure mommies of girls have their share of worries. If I had a daughter I would worry about the hoochie-mama preschool clothes being marketed at Target and the fact that she wold probably inherit my lack of coordination and never be an Olympic figure skater. But I am a mama of two boys and my new worry is how am I going to keep The Boys out of the e.r. for the next eighteen years? I have two boys, too, and I figured I'd visit the ER at least once for each of them and at 2.5 and almost 5, I've already been once for each and another time to urgent care for the older one. Lord help me when they get older and do bigger, stupider things. I had four boys and two girls. The boys were in the er more than the doctors. There were stitches and broken bones and, oh so many ouchies. It is a running joke that, if it is a special occasion, someone will end up in the er. But, they all grew up into Godly men. What more can we ask? I LOVE that he said AMEN after his time out. That. Is. Priceless. I had a ridiculous day with the boys yesterday. They were being soooo naughty. People were getting "Bonk head" from their "frufer" (brother). What the? Stop maiming each other!!! Sir Crankypants. I like that. five minute friday - "home"
five minute friday - "backwards"
five minute friday - "everyday"